15:16 GMT – Pentagon chief says he doesn’t “see any prospect” of the U.S. military becoming involved in the troubles in Georgia. 13:37 GMT – EU’s aid for victims of South Ossetian crisis may be as much as 10 million euros, announces a European Commission spokesman. 13:33 GMT – South Ossetian leader Eduard Kokoyti claims mercenaries from Ukraine, Baltic states and U.S. fought alongside the Georgian troops in South Ossetia. 12:27 GMT – Georgian Parliament approves plan to quit the CIS. 12:06 GMT – OSCE announces tenfold increase in the number of observers in Georgia. 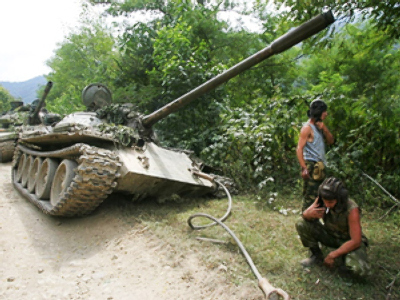 11:25 GMT – Abkhazian authorities report three people have been killed in Kodori gorge during the operation to drive out Georgian troops. 10:24 GMT – Russia will not force CIS countries to support it over South Ossetia, says Lavrov. 09:52 GMT – Russia will support any decision made by the people of Abkhazia and South Ossetia over their constitutional status, says Medvedev. 08:47 GMT – Regional administration of Gori re-take control of the Georgian city. 09:42 GMT – The leaders of South Ossetia and Abkhazia sign a peace plan to resolve their conflict with Georgia, at a meeting with Russian President Dmitry Medvedev in Moscow. The peace plan was drawn up on Tuesday during a meeting between Medvedev and his French counterpart Nicolas Sarkozy. Georgia has also accepted the plan. 08:37 GMT – The West's stance on the situation in Georgia is certain to affect Russia's relations with NATO, says the organisation’s Moscow's ambassador. 06:59 GMT – U.S. Secretary of State Condoleezza Rice has said Russia faces international isolation if does not honour a ceasefire with Georgia. 05:26 GMT – Russian investigators have opened a criminal case on charges of genocide in connection with recent events in South Ossetia, according to the General Prosecutor's Office.